In the silence of the space, an asteroid runs around one of the many slowly fading stars. Small, insignificant beings from a distant planet called it the Amelia’s Jewel. The most greedy of these creatures have decided to exploit its resources. Together, they caged this irregular gem with a web of drilling stations and satellites as grotesque ornaments. Now the time has come for you. Become a gear wheel in a well oiled corporate machine and bring your overlords the biggest profit in this exploitation race – Darkrock Ventures. In August 2016, the game Darkrock Ventures came to the backers supporting her campaign on Kickstarter. Founded in just 9 days, supported by 963 people. 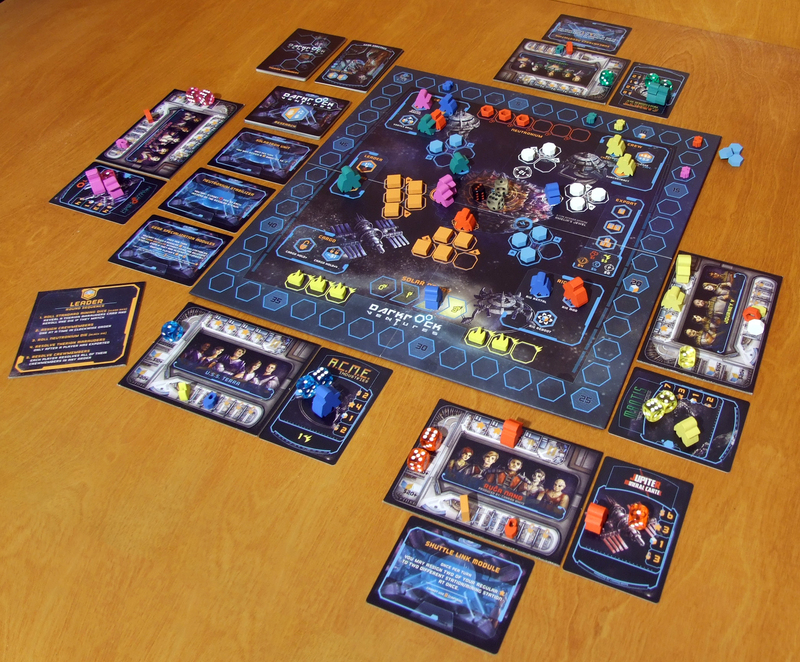 Design by Michael Eskue and Andrew Enriquez, illustrated by Naomi Robinson and Darrell Louder, was released by Magic Meeple Games and Gamelyn Games. The game with its first expansion pack is available at the publisher’s website. 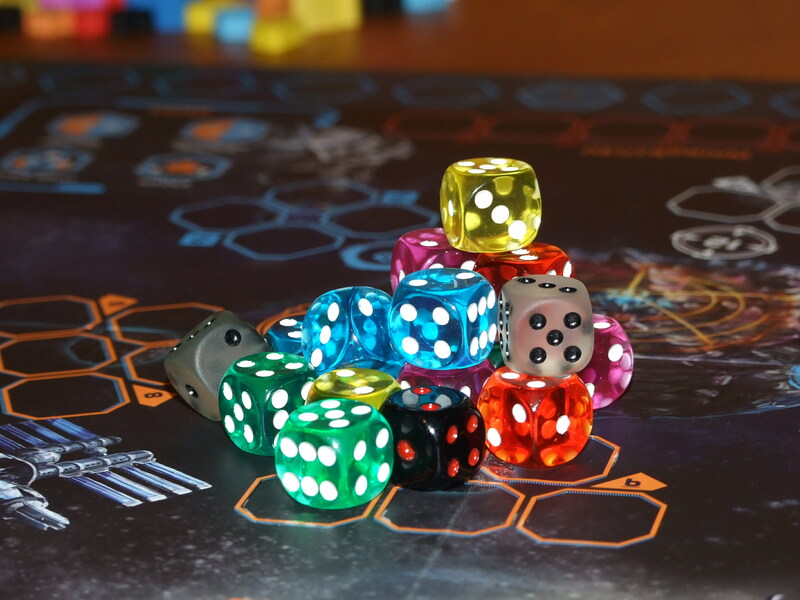 In a compact sturdy box, we get 18 neat plastic six-sided dice – one black and the others transparent, in different colors. 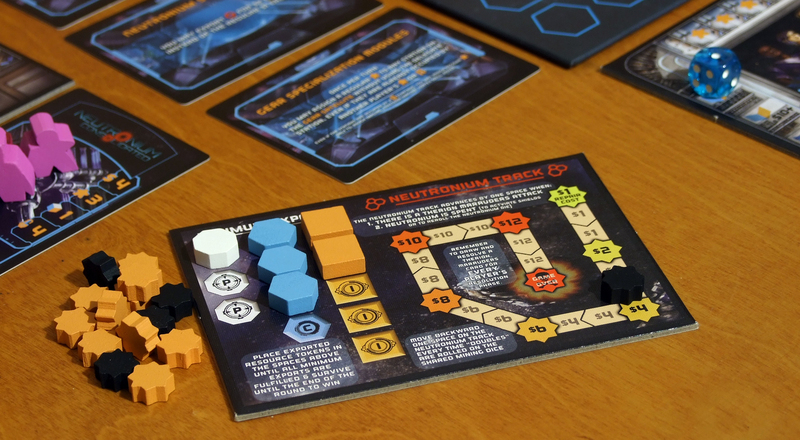 Seven tiles made of solid cardboard – five double-sided players’ boards, the first player marker with a turn sequence, and the neutrino track to the solo / co-op variant. On one side of the players’ boards we have an illustration with the crew we are playing, and on the other, a reminder describing the action of the board areas – a convenient solution for the forgetful. Apart from this difference, there is a place for pawns, dice and cargo on both sides, so we do not have to switch them, when we forget something. Next we have cards, among them a technology deck, corporate sponsors and Therion marauders attacks – linen finish of cards like in the USPC decks which means the quilting of the averse and the linear notches of the reverse side makes them easy to shuffle, durable and pleasant to touch. 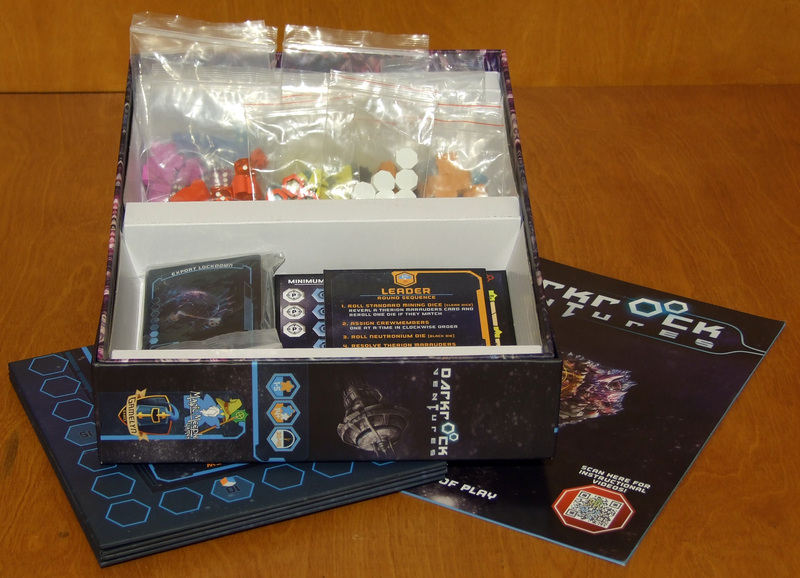 The game board is a 14″ square, with a matte illustrated surface and glare finish for meeple and token spots. 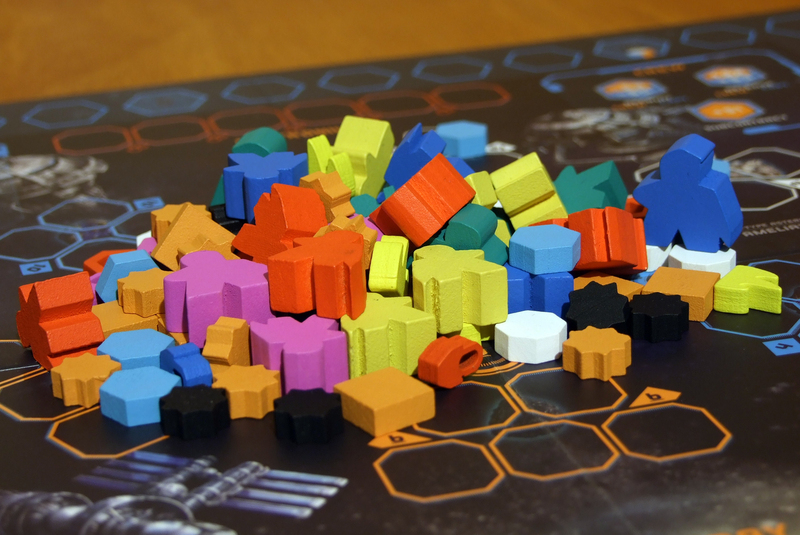 Lastly, we find a stack of wooden meeples, resource and player markers – all in vibrant colors and various shapes. Illustrations are very consistent with the futuristic style of designations on components, perfectly conveying the atmosphere of space mining companies. We are dealing here with a very skillfully designed combination of two mechanisms. The first one is push your luck, where, as in poker, Texas Hold’em, we get two values ​​on the cubes available to everyone, bet on the expected result, add another die and hope that our set of dice will drop the values, ​​allowing us to get score that we bet on. 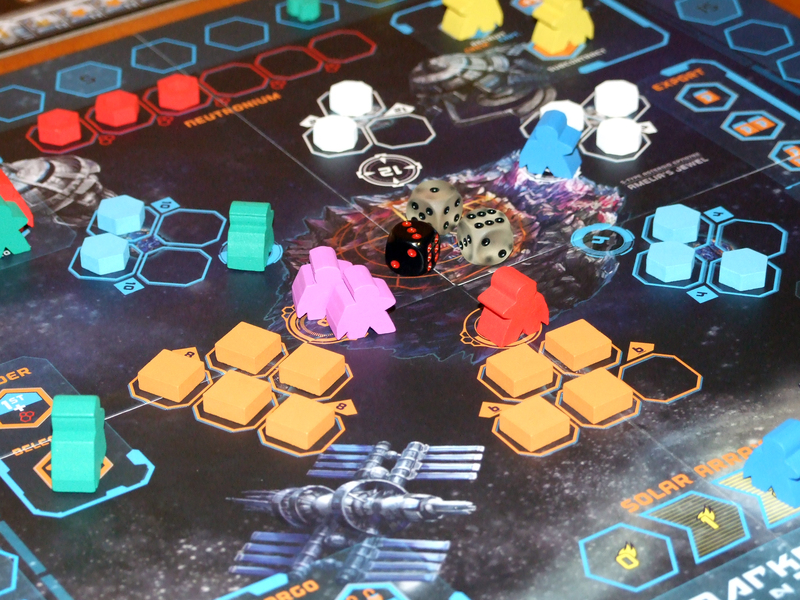 The second mechanism is worker placement, where we delegate our space miners to perform specific actions on a turn. The combination of these two mechanics results in strategic luck mitigation. If you want, you can rely on dice and dig a fortune or get nothing. You want to be sure of the results, fight for the appropriate stations that allow you to mess with the values ​​on your dice. 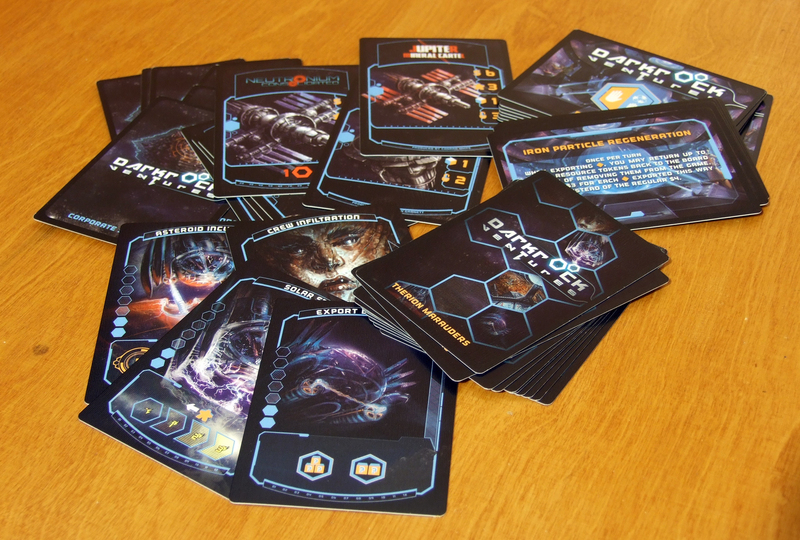 The player, who at the end of the game will have the most credits for the collected and sold materials, wins. 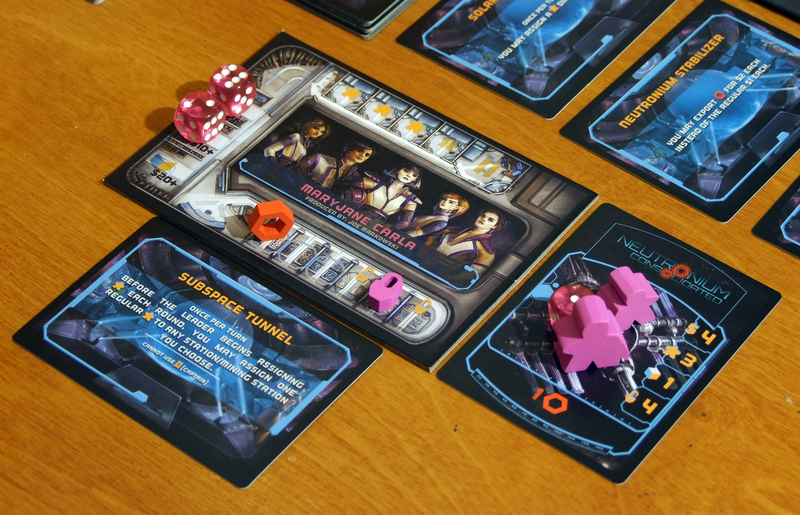 The game offers, apart from competitive variant for 2 and 5 people, the option to play in two with hired saboteurs interfering and a co-op / solo variant – in which the team will struggle with time and damage done to the station to complete the contract before the flying piece of rock will vanish in vast space. In addition, the gameplay can be modified with several elements. You want every player to have an asymmetrical start – you just need to add a deck of corporate sponsors. You would like to differentiate for each player unique powers – add a technology deck. Not enough of a random factor? – use Therion marauders deck in play, which will force players to additionally manage their resources, sell a dug out load, or prepare to pay for safety of using the attacked stations of the board. Options for composing the game’s elements and variants before it starts, make it a virtually inexhaustible source of replayability. Each of the 24 stations of the board gains and loses importance depending on the variant, components chosen for the game and, of course, the current situation on the board. I love the mechanisms of available options you can assign your worker to, this is one of the few games in the worker placement genre, in which the spot for taking the first player card has a strategic sense until the very end. Similarly, it is rarely possible to place multiple meeples on one spot and thus multiply its effect, which is great here. Darkrock Ventures, a jewel in its category. Compact engine for luck mitigation and movement optimization. The maximum play time with rules explaining can take 60 minutes. The rules themselves are extremely easy to explain, and the pictograms on the board are practically self-explanatory. After each game, you want to start the next one. A game that will fit even on a small coffee table, offering a comprehensive brain-eating play. A neat box, in which we do not carry unnecessary air, can be easily put into a backpack, so that it’s always at hand. In my opinion, it is a certain candidate for the “must have” list. From the first moment when I sat down to test it, in my head I heard Terran One from Starcraft, and the whole soundtrack from Blizzard game in my opinion really complements the atmosphere of the game, therefore I strongly encourage you to play while listening to it.